A very busy week saw the pound stage a recovery but erode the gains while the yen was the back foot. The upcoming week features UK Inflation and employment data, the ECB’s rate decision, US housing figures and more. These are the main events on forex calendar. UK Inflation data: Tuesday, 8:30. Analysts expect policymakers will issue economic stimulus to increase inflation. UK inflation is expected to rise 0.4% this time. US Building Permits: Tuesday, 12:30. US building permits are expected to rise to 1.15m in June. UK Claimant Count Change: Wednesday, 8:30. The total number of unemployed is expected to rise by 4,100 in June. Eurozone Rate decision: Thursday, 11:45. President Mario Draghi said he expects economic growth will continue at a moderate but steady pace. US Philly Fed Manufacturing Index: Thursday, 12:30. Philly manufacturing index is estimated to rise to 5.1in July. US Unemployment Claims: Thursday, 12:30. The number of jobless claims is expected to rise 271,000.Building Permits. Daily price is on bearish breakdown to be started on open D1 bar for now: the price is testing 1.1001 support level to below for the bearish breakdown to be continuing. Chinkou Span line is located below the price for the bearish market condition by the breakdown by the direction. 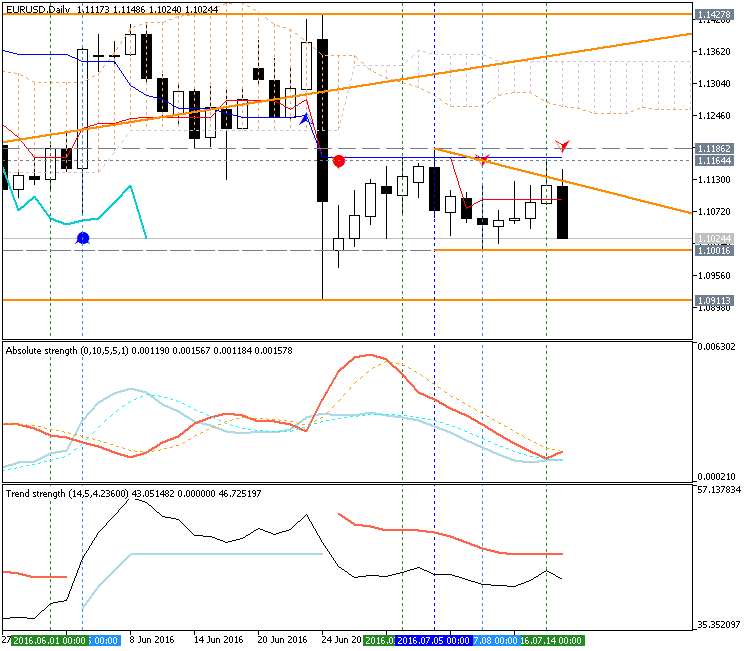 Absolute Strength indicator is estimating the primary bearish trend to be started after ranging bearish condition. Trend Strength indicator is evaluating the trend as the primary bearish in the near future. 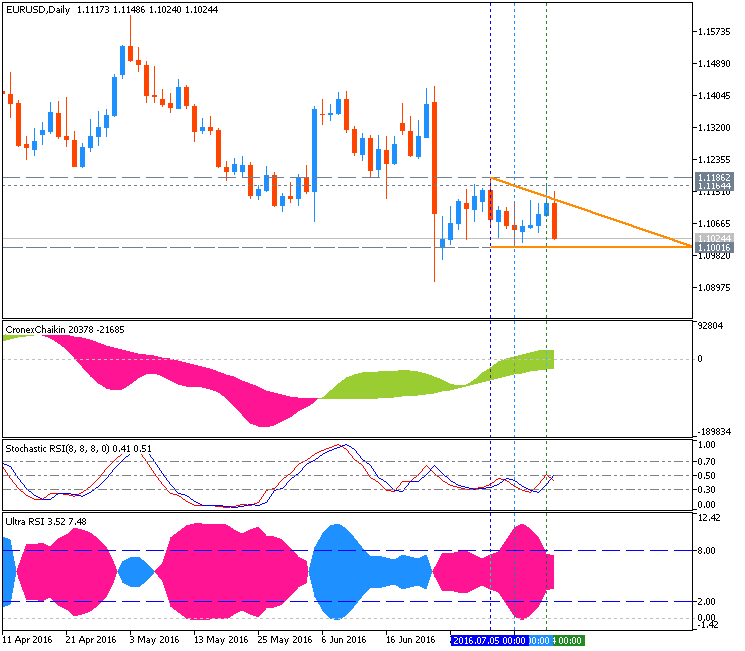 If the price breaks 1.1001 support level to below on close D1 bar so the bearish trend will be continuing up to 1.0911 level as a target to re-enter. If the price breaks 1.1186 resistance level to above on daily close bar so the bear market rally will be started. If not so the price will be on ranging bearish within the levels. 1305.46 support level located in the beginning fo the secondary correction. 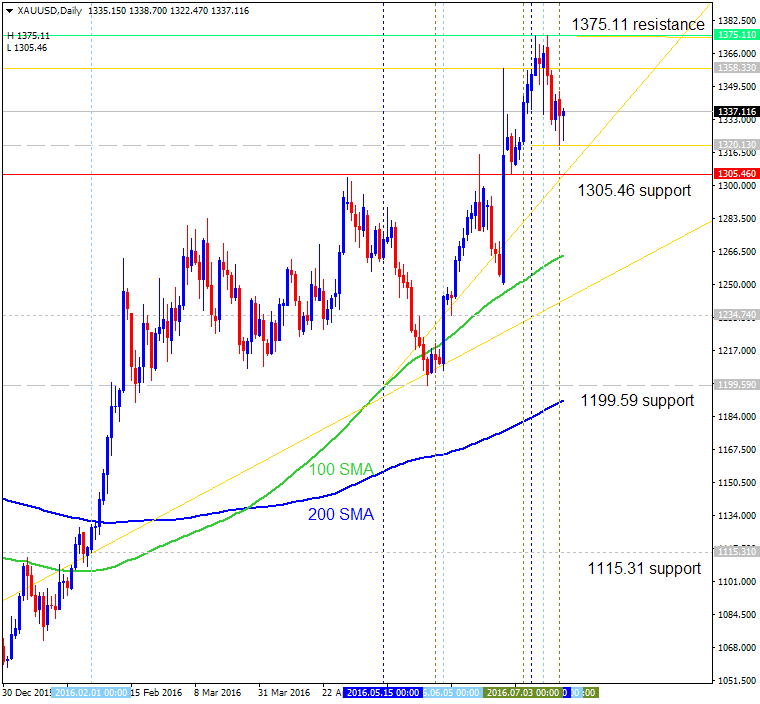 If the price will break 1375.11 resistance level so the primary bullish trend will be continuing. If the price will break 1305.46 support level so the local downtrend as the secondary correction within the primary bullish trend will be started. If price will break 1199.59 support so we may see the reversal of the price movement to the primary bearish market condition with 1115.31 possible bearish target. 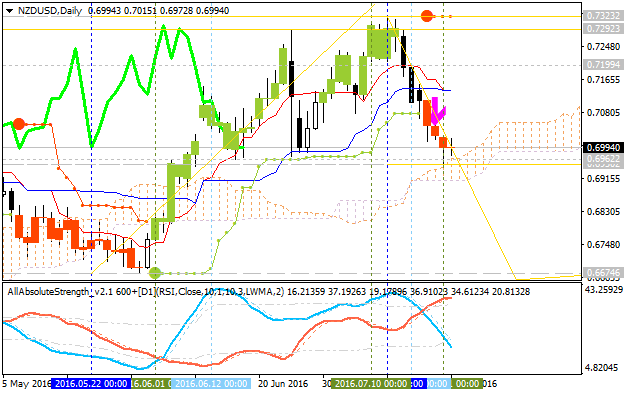 0.6950 support level located near Senkou Span line of Ichimoku indicator in the beginning of the bearish trend to be started. Descending triangle pattern was formed by the price to be crossed to below for the bearish trend to be started. or the bullish ranging within the levels. Chinkou Span line is crossing the price to below on open daily bar for the possible daily breakdown.